MUST WATCH: Duterte Warned NAIA Personnel Regarding 'Tanim Bala' Issue! 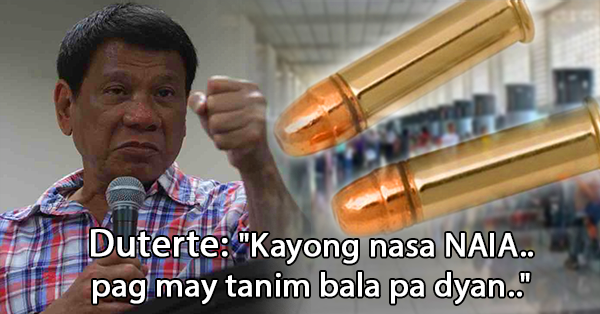 The soon-to-be-president of the Philippines Rodrigo Duterte warned all personnel of the Ninoy Aquino International Airport (NAIA). This was regarded to the issue of bullet planting scheme, locally known as 'Tanim Bala' or Laglag Bala' to some passengers in the airport. As a recall, the said modus operandi is a series of cases happened to airport passengers in the NAIA terminal that has started since September 2015. The incident is allegedly done by airport security personnel as a means of extortion. Duterte said that there is an unproven syndicate behind the event, "Kayong mga nasa NAIA, 'pag may tanim pa d'yan, lahat kayo alis. ", his brave message against them if the said issue will not be solved as this was already caught the attention both the local and international press. "Do not do it to me because as I said I am awed and humbled by the vote given to me by the people for after all I did not also ask that I'd be president,", he added. A new administration will be coming soon and a new policy will be implemented. Everyone is looking forward and hoping for a change for the betterment of the country.